Winter is in full force- make sure your lower back pain does not! The kids are now back to school after winter break, and many of us take this time to finally get back into a daily routine, and take care of lingering aches and pains we didn’t get to address the summer months. One of the most common ailments we see during this end -of-summer into Fall season at the office is folks trying to get their lower back pain under control. As one of the most common injuries we see in the office, roughly 8 out of every 10 of us will experience back pain, one of more than 3million cases annually. And many people suffer through it, assuming it will go away. Back pain comes form a variety of sources including the vertebral joints, ligaments, and discs, and often form the sacroiliac joints of the pelvis. When any of these structures becomes injured, your muscles will spasm in an effort ‘protect and immobilize’ your spine. This pain generally is focused to the lower back, waistline, and into the buttocks, sacrum, and can refer into the thigh or hamstring region, and even feel like electricity radiating down your leg. 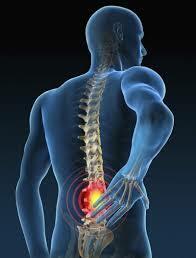 As a general rule about back pain, the further the pain radiates out, the worse the injury sustained. We tend to liken it to an earthquake: the bigger, more-damaging category of the earthquake, the further out it radiates. And, as symptoms improve, they tend to come back to the ‘source’ of the pain, and process we call ‘centralization’. What can I do to avoid and/or remedy lower back pain? 1) Avoid sitting for more than 1hr straight- if you can. Sitting causes our spine to flex forwards, and staying in this position puts your ligaments, joints on a prolonged stretch- so the longer you sit, the more risk of back pain. Sitting also places a lot more load on the discs in a flexed position, which can lead to disc injury, building and herniations, so take note! Tip: Get up and walk around for a 1:1 Ratio, (minutes : seconds) for sitting vs standing. So, if you’ve been sitting for 30 minutes straight, get up and walk around for 30seconds, and so on. Also try and take rest-stop breaks with road-trips. Stand up, walk around and keep mobile! If you’ve been sitting, your back has been forward-flexed for some time. The ‘opposite’ rule means to do the opposite motion to balance things out. For example, If sitting (a flexed, forward bent position) stand up and and try to get a little back-bend in the lower back. If this is painful, try getting on your stomach, and prop yourself on your elbows (pictured), and relax those muscles for a minute or so before getting back in that flexed position. Camping on the ground, or on your cousin’s futon mattress can reek havoc on your back, so take some time to think about these options to help support/alleviate pain in the back while sleeping. Regardless of surface, you can usually improved your comfort with a few pillows. If you’re a side-sleeper, try adding a pillow in-between the knees. If you sleep on your back, elevate your knees to flatten out your lower back. 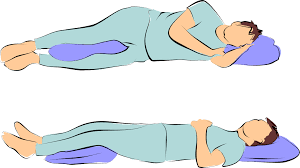 But please, if you can, try to NOT sleep on you stomach, it can compress the back, and also add stress to your neck. If you must, try placing a pillow under your waist. In general, if lower back symptoms persist more than 2+ weeks, it’s best to have things evaluated, and to make sure there is nothing more serious going on. Most of the time, only a few PT visits is enough to get you on track, as there is many simple dos/don’ts that can alleviate your symptoms- not unknowingly aggravating things! Give us a call 503-904-9038 or reach out for a Free Consultation today!